Every year in the United States the National PTA sponsors PTA Teacher Appreciation Week. It's an opportunity for us parents to thank the many teachers, administrators, and support staff that educate our children and enrich their lives. For the 2014-15 school year, the PTA Teacher Appreciation Week is May 4-8, 2015. It's never too early to start thinking about ideas and that's why I've put together the Pumpkin Time! Teacher/Librarian Appreciation Gift inspired by the picture book Pumpkin Time! 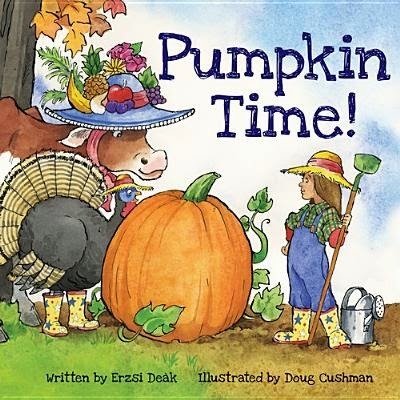 by Erzsi Deak, illustrated by Doug Cushman (Soucebooks, 2014). A book for all seasons! The day the cows strolled down Main Street in fancy hats...Evy didn't notice. Evy is so focused on watching her garden grow that she misses all the silliness going on around her--pigs dancing, donkeys flying, and sheep having a picnic. But after Evy's spent all year taking care of her garden, everyone's invited to pumpkin time! Isn't that what teachers do? Take care of our children. Cultivate our children. Nurture our children. I thought this book would serve as a lovely addition to teachers' classrooms and the perfect gift to say thank you no matter what time of year it is. Step 1. Using your computer or handwrite "Teachers plant the seeds of knowledge that will grow forever" on your card stock. Then cut out your card using scissors and decorate. You can punch a tiny hole in the card and string some twine through. This will allow you to attach the card to the gift. Step 2. Roll out some of your see-thru-plastic wrap and assemble your plant stand, gloves, rake, seeds, and picture book in the center of the plastic wrap after you've cut it to the size you need. Step 3. Pull up all four corners and bunch together in the middle. Tie your string around the plastic wrap to secure it. Then attach your card. Deliver to your favorite teacher or librarian! We appreciate them. We really do! I just might steal it for Simple Saturday in the spring. Not now. Snow is on the horizon. Thanks, Deb!! It was so much fun to make and even better when we delivered it to our favorite librarian!